A synagogue’s success lies in its ability to care for its members - physically, emotionally, and spiritually. And one of the most profound and meaningful ways to do that is to support individuals and families during moments of joy and in times of pain. The way we grow as individuals, the way we find meaning in this world, is through our care for others. The Caring Community is the way each of us can respond "Hineini," here I am, by responding to the calls of fellow Temple members. The Caring community writes cards to those in need of healing, delivers meals to bereaved families and delivers meals to those who are recovering from illness or surgery and to families of newborns. We offer rides to the temple for those who wish to attend services or a program but are unable to drive. Here at Temple Isaiah we want to work even harder at caring for the needs of all our members. The Caring Community committee, along with the clergy and staff, need your help. Please share your joys and challenges with us so that we can lift you up, support you, and celebrate with you. Contact: Liz Marks Pollak at lizmarks@gmail.com if you would like to learn more or would like to get involved in our efforts. 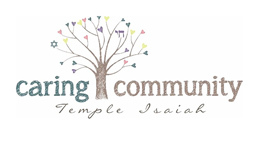 Temple Isaiah is participating in The Ezra Network, an initiative of The Jewish Federation of Greater Los Angeles in partnership with Jewish Family Service, Bet Tzedek Legal Services and Jewish Vocational Service to provide social services within synagogues. Through The Ezra Network, a social worker, job counselor and legal counselor are available to serve our community – providing guidance and assistance to those in our congregation, as well as non-members in the area. What you talk about with these professionals is totally confidential. In fact, unless you sign a consent form, they will not even share with the rabbi or anyone else at the synagogue that you in fact have spoken or met. Our congregation is part of a cohort that includes Temple Beth Am and Temple Emanuel, so you can meet either here or at one of these other synagogues or by phone, whatever is the most comfortable and convenient for you! To make an appointment with Nina Reinis, the social worker, call 323.600.5722. For the Bet Tzedek Legal Counselor call 323.549.5827and for the Jewish Vocational Service Job Counselor, Liz Mohler, call 310.728.5567. This is a FREE service to members of our community. If you have any questions, please contact Rabbi Joel Nickerson at rabbijoel@templeisaiah.com.